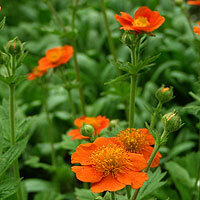 Cultivation tips: Geum's flourish on most moist garden soils, yet they don’t like wet or heavy clay soils. Plant in a sheltered sunny spot towards the front of the border where they can grow without being smothered by taller plants. Prop by dividing in autumn or spring.